Mr Daniel Bugri Naabu, the New Patriotic Party’s Northern regional Chairman, has accused Mr Rockson Bukari, the Upper East Regional Minister, as well as Minister of Gender, Children and Social Protection, Ms Otiko Afisa Djaba, of having a hand in the murder of the party’s late Upper East Regional chairman Adams Mahama. Mr Mahama was murdered in an acid attack at his residence in 2015. 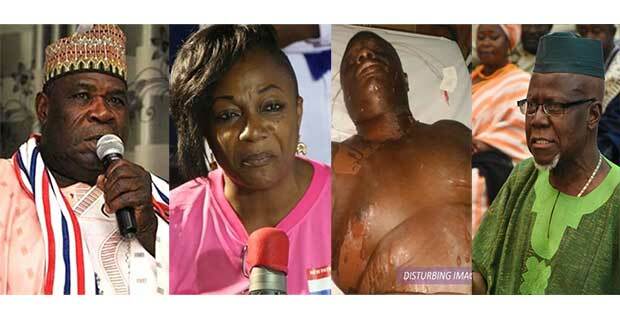 “You could remember Adams Mahama who certainly died when he was bathed with acid, [it was through] the same secret meetings ...”, Mr Bugri Naabu alleged in an interview with Radio XYZ while responding to allegations of bribery made against him by Ms Djaba whose “secret” meeting he scuttled on Saturday. “You’ll be surprised that some of these people who masterminded the killing of Adams have come to take positions in the government ... like the Upper East Regional Minister. He was deeply involved in the masterminded killing of Adams,” Mr Bugri Naabu alleged to Radio XYZ's Reporter Isaac Nognya in an exclusive interview. Mr Naabu also said the party executives in the Northern Region will not watch aloof as the “Sandema constituency organiser who is supposed to be Paul Afoko’s younger brother” is also given a position in the Akufo-Addo government as a District Chief Executive. “... We are not going to sit down to allow this to happen, people who will come and destroy our government, to come and spoil our government, we the regional chairmen have been talking since yesterday and we are not going to take it like that,” he said.